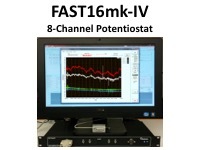 The 8-channel FAST16mk-IV can record electrochemical data (amperometry, chronoamerometry) from up to 8 independent channels, has 4 digital (event) lines and generates waveforms for experimental control. With real time display rates up to 1000Hz. Viereckel T, Konradsson-Geuken A, Wallen-Mackenzie A "Validated multi-step approach for in vivo recording and analysis of optogenetically evoked glutamate in the mouse globus pallidus"
Miller EM et al. "Chronic Methylphenidate Alters Tonic and Phasic Glutamate Signaling in the Frontal Cortex of a Freely-Moving Rat Model of ADHD". Mayer, F.P., et al. "An unsuspected role for organic cation transporter 3 in the actions of amphetamine." Geyer, E.D., et al. "Adaptation of Microelectrode Array Technology for the Study of Anesthesia-induced Neurotoxicity in the Intact Piglet Brain." Ferreira NR et al. (2018) "Simultaneous measurements of ascorbate and glutamate in vivo in the rat brain using carbon fiber nanocomposite sensors and microbiosensor arrays." Campos-Beltran D et al. 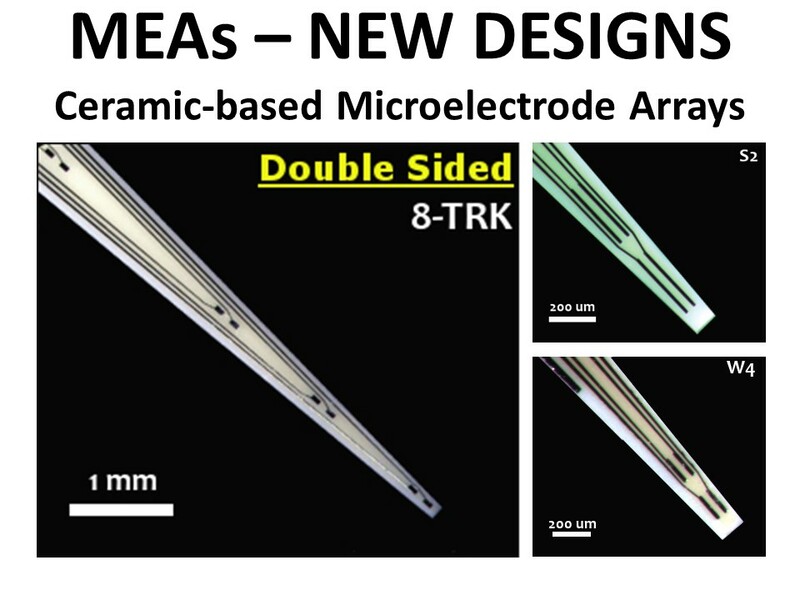 "Amperometric Self-Referencing Ceramic Based Microelectrode Arrays for D-Serine Detection." Batten SR et al. "The Role of Glutamate Signaling in Incentive Salience: Second-by-second Glutamate Recordings in Awake Sprague Dawley Rats". Wang DV, et al. "Disrupting Glutamate Co-transmission Does Not Affect Acquisition of Conditioned Behavior Reinforced by Dopamine Neuron Activation." Thomas TC et al. "Acute treatment with doxorubicin affects glutamate neurotransmission in the mouse frontal cortex and hippocampus." Thakur P et al. "Modeling Parkinson's disease pathology by combination of fibril seeds and alpha-synuclein overexpression in the rat brain". Sompol, P., et al. "Calcineurin/NFAT Signaling in Activated Astrocytes Drives Network Hyperexcitability in Aβ-Bearing Mice." Smith, A.C.W., et al. "Accumbens nNOS Interneurons Regulate Cocaine Relapse"
Scofield MD "Exploring the Role of Astroglial Glutamate Release and Association With Synapses in Neuronal Function and Behavior." Nackenoff AG et al. "Serotonin Transporter-Independent Actions of the Antidepressant Vortioxetine As Revealed Using the SERT Met172 Mouse." Lourenço, CF., et al. "Neurometabolic and electrophysiological changes during cortical spreading depolarization: multimodal approach based on a lactate-glucose dual microbiosensor arrays." Ledo A et al. (2017) "Combined in Vivo Amperometric Oximetry and Electrophysiology in a Single Sensor: A Tool for Epilepsy Research." Ledo, A., et al. "Ceramic-Based Multisite Platinum Microelectrode Arrays: Morphological Characteristics and Electrochemical Performance for Extracellular Oxygen Measurements in Brain Tissue." Hunsberger HC, et al. "Using Enzyme-based Biosensors to Measure Tonic and Phasic Glutamate in Alzheimer's Mouse Models." Hunsberger HC, et al. "Peripheral viral challenge elevates extracellular glutamate in the hippocampus leading to seizure hypersusceptibility." Howe, W.M., et al., "Acetylcholine Release in Prefrontal Cortex Promotes Gamma Oscillations and Theta-Gamma Coupling during Cue Detection." Hascup KN., et al. "Enhanced Cognition and Hypoglutamatergic Signaling in a Growth Hormone Receptor Knockout Mouse Model of Successful Aging." Bortz, DM., et al. "Oral administration of a specific kynurenic acid synthesis (KAT II) inhibitor attenuates evoked glutamate release in rat prefrontal cortex." Womersley, JS., et al. "Effect of cocaine on striatal dopamine clearance in a rat model of developmental stress and attention-deficit/hyperactivity disorder." Viereckel, T., et al. "Midbrain Gene Screening Identifies a New Mesoaccumbal Glutamatergic Pathway and a Marker for Dopamine Cells Neuroprotected in Parkinson's Disease." Sung, U., et al. "Ca2+ dependent surface trafficking of norepinephrine transporters depends on threonine 30 and Ca2+ calmodulin kinases." Hunsberger, et al. "Peripherally restricted viral challenge elevates extracellular glutamate and enhances synaptic transmission in the hippocampus." Hunsberger, HC., et al. "Riluzole rescues alterations in rapid glutamate transients in the hippocampus of rTg4510 mice." Hascup, KN. and Hascup, ER. "Soluble Amyloid-beta42 Stimulates Glutamate Release through Activation of the alpha7 Nicotinic Acetylcholine Receptor." Gritton, HJ., et al. "Cortical cholinergic signaling controls the detection of cues." Brown, DP., et al. "Target-directed discovery and production of pharmaceuticals in transgenic mutant plant cells." Bortz, DM., et al. "Positive allosteric modulators of the alpha7 nicotinic acetylcholine receptor potentiate glutamate release in the prefrontal cortex of freely-moving rats." Benmansour, et al. "Comparison of the Antidepressant-Like Effects of Estradiol and That of Selective Serotonin Reuptake Inhibitors in Middle-Aged Ovariectomized Rats." Aldrin-Kirk, P., et al. "DREADD Modulation of Transplanted DA Neurons Reveals a Novel Parkinsonian Dyskinesia Mechanism Mediated by the Serotonin 5-HT6 Receptor." Quanteon, LLC was established in 1996, and is dedicated to the development of FAST Analytical Sensing Technology which allows second-by-second monitoring of neurochemicals in vivo. In association with the Center for Microelectrode Technology, we aim to provide state of the art microelectrodes and biosensors for in vitro and in vivo application in research. We are continuously developing, innovating and improving our products to provide you the latest in microelectrode technologies. Let Us Know About It!! Are you publishing data using the FAST system? DISCLAIMER: The FAST recording system and accessories are sold for the sole purpose of research only. They cannot be resold or used commercially for clinical or basic science services.